76 years this month, the Royal Navy lost the last 8in cruiser it had built, it wasn’t the last in service at that point, but after HMS Exeter, the second of the York Subclass of the Counties class Heavy Cruisers was finished the RN had decided the 6in was a better fit for its needs and along came the Town class to fill the ‘status gap’ a concentration on light cruisers left. She is most famous for her part of the River Plate, yet unlike her colleagues in that fateful battle she was not survive the war – being lost at the (Second) Battle of the Java Sea on the 1st of March 1942. This was a ship which had served before the war in every ocean and sea the RN was required, by the interests of the empire it was sworn to protect, to be in. During WWII she did her best to repeat that performance, to a large extent succeeding in this quest. HMS Exeter achieved all this even though she’d only been completed in July 1931, a fact which meant she had less than eleven years in service when sunk by the Japanese. With such a short life, using some brief glimpses of HMS Exeter’s service history to shed light upon the role, purpose, operations and achievements of the RN’s cruiser force might seem, at first glance, a little strange. The truth is though HMS Exeter, thanks in large part to her moving assignments, her pre & war time deployments, her successes and her failures, make her the perfect entry point into the RN interwar cruiser story. More importantly than all that though, is the history – HMS Exeter, might have had a short life, but not only did she cram a lot into it, she really lived it – whether it was charging a German commerce raiding pocket battleship or fighting off an air attack, whatever came her way, HMS Exeter could be relied upon to do her level best to give back way more than she’d received. None of this though mattered when she was ordered, what matter then were words written on paper by leaders still cringing from their experiences of WWI. HMS Exeter and her sister, HMS York (which provided the class name), were built from the start as ‘Class B’ cruisers. They were supposed to be an affordable variant of the Counties which had been the main focus of construction in the 1920s. They were supposed to cost less and displace less allowing for more to be built on the treaty allocated tonnage allowance. In reality they only cost 1/8th less than the counties – but were better overall ships, as despite only having three turrets (one of the main areas sort to reduce cost), they had similar amounts of armour, which was as a result of concentrating on three rather than four turrets was far more evenly distributed over the 50ft shorter hull. This meant they had better levels of protection, the same power plant arrangements meant they had similar speeds and endurance as the ‘full sized’ Counties. The York’s also retained the 8in guns which defined the Counties and confirmed on the York class the status of Heavy Cruisers. By the beginning of WWII in addition to her main armament Exeter carried four QF 4in guns in single mounts, eight 0.5in Vickers machine guns in two quad mounts and six 21in torpedoes in two triple mounts; displaced at full load 10,410t, had a top speed of 32.25kts and a range of 10,000nmi at 14kts. 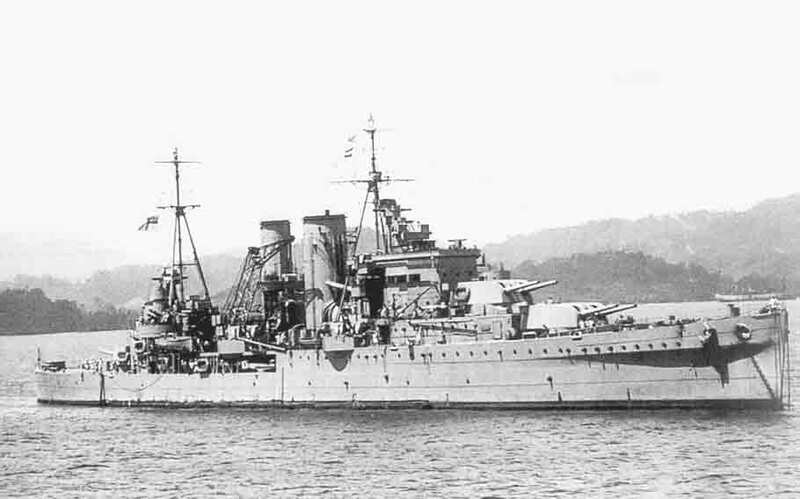 However, there is a reason they were the last heavy cruisers the RN built, simply put for the trade protection, for the defence of empire in both peace and war, the RN couldn’t build enough cruisers if it built heavy cruisers. In terms of cost of construction, manning, logistics, the 8in ships all required the RN to accept less numbers than it needed. The existence of the York class itself though is something of fraught topic, the RN considered them a class, but several Historians, notably Friedman & Whitley choose to treat them more as individual single ship classes. This is because of the differences in design – one was ordered in 1926, the other in 1927. During that time the debates about cruisers role continued, technology continued and as such the two ships do look at least superficially different – especially in terms of superstructure. It’s an interesting debate and focuses on the nuances of the ship design process, but they were the only three turreted 8in gun cruisers the RN built and the RN considered them a class, so for the purposes of this paper that’s what they will be treated as… although see picture of HMS York below for the comparison with her sister. This though is not the most important debate which encompasses the class. Figure 2. 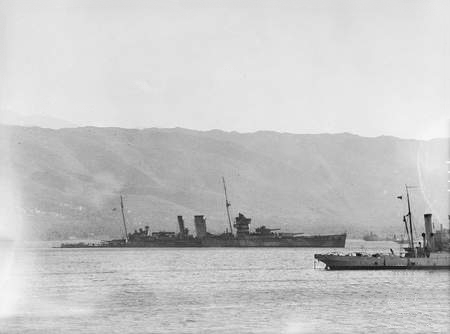 HMS York of Suda Bay, May 1941. The debate between the gun types was orientated around not only the capabilities of the gun, but the missions expected of the cruisers, how those missions would be carried out and perhaps most importantly the number of missions needed to be carried out simultaneously. The 8in was considered the better weapon for engaging likely heavily armed enemy surface raiders; the 6in was originally considered the more suitable for fleet operations where the cruisers could fall back on capital ships for support if they encountered something more powerful. This explained why nations with fewer capital ships preferred the heavier guns, also why nations presuming a war of a Mahan style, preferred heavier guns as they were thinking of one large battle. Britain, which was looking at more distributed style conflict, kept exercising, testing its ideas and ended up going its own way. However, things in this debate only really started to change, with the development of the MKXXIII mounting for the 6in gun, which meant each turret could accommodate three barrels. This combined with a rate of fire per gun more than double that achievable by the 8in weapon and the effective engagement range, pre-radar being closer to the 23km of the 6in rather than the 28km of the 8in, shifted the debate within the RN at least, in favour of the 6in. The decider probably being that at 18km (20,000 yards) range in first minute, a County class, with eight guns could put 2629kg of high explosive at the target, a later Town class (HMS Belfast and sisters) only 2203kg; but by minute two the Town class would have reached 9547kg, the County’s only 7269kg – the York’s by minute two would even be out fired by the Leader class with double 6in turrets. Within the space of 5 minutes at 18km the Towns would out fire a County by 10 Tons, more importantly perhaps would have fired more than 3x as many shells – with a consequently greater chance of achieving a decisive hit. That is why the York’s were not repeated and why when the RN was looking to build bigger cruisers it didn’t return to the 8in and why it was prepared to exchange Heavy Cruiser tonnage for Light Cruiser tonnage in the 1930 London Naval Treaty. To an extent therefore it could be claimed that the York class, Exeter in particular were if not obsolete, were the end of one line of thinking, before the full emergence of another. This did not mean they weren’t useful, in fact the very opposite, both ships would be very heavily employed, as has already been said, throughout their careers. HMS Exeter, served with the Atlantic Fleet (1931-33) upon entering into service, before joining the America & West Indies stations 1933-39. However, the highlight if there was one of this pre-war career, came in the 1936, with a temporary deployment to the Mediterranean for the standoff with the Italian navy that resulted from the Abyssinian crisis. War of course was averted, but she as one of the few heavy cruisers that could be redeployed quickly, was critical to the speedy build-up of presence the RN achieved. However, she returned to her previous station and when war broke out, was advantageously placed to play a critical role in one of the first battles of the conflict, the Battle of the River Plate. The Battle of the River Plate is famous, partially because of the 1956 movie Pursuit of the Graf Spee, but also because it came at a time of war when Britain was still uncertain of it role in what was at that time referred to as the ‘Phoney’ war. It had been one of the nightmares of the RN, for one of the power surface raiders of the German navy to get out in the sea lanes far beyond the concentrations of the major naval forces. The Admiral Graf Spee was a Deutschland Class cruiser, commanded by Captain Langsdorff. Termed by some as ‘Pocket Battleships’ because of how heavily armed they were for their displacement of 16,280t (fully loaded); carrying six 11in guns in two triple turrets, eight 5.9in guns in single turrets, eight 21in torpedo tubes and eight 2cm anti-aircraft guns (originally fitted with ten, two were transferred to her support ship the Altmark off the Canary Islands on the 1st of September). With a top speed of 28.5knots, a range of 16,300nmi at ~18knots, and a pair of Arado Ar 196 seaplanes, she was certainly suited to her task. The most important thing though that she carried, was one of the first working fitted types of the SEEKAT radar, enabling her to find and fix targets in any weather. 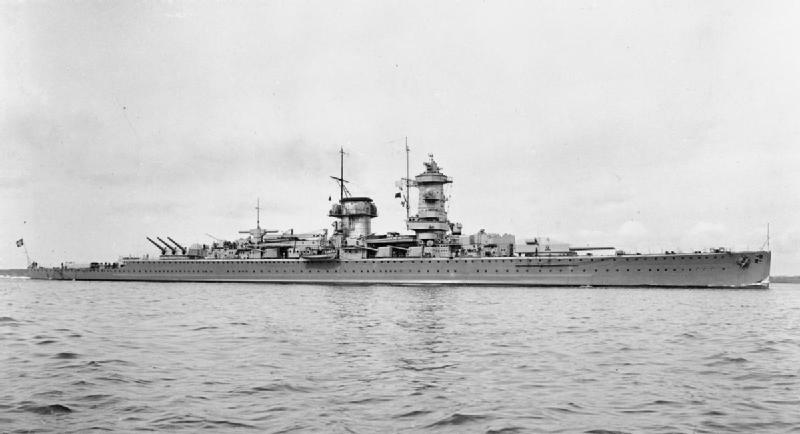 In total Graf Spee sank nine merchant ships, the Clement, the Newton Beech, the Ashlea, the Hunstman, the Trevanion, the Africa Shell, the Doric Star, the Tairoa, and the Streonshalh; what of course is not really known is how many journeys were lengthened, or even cancelled, because of her actions, how the resources of the eight groups that were put together to hunt her down could have effected other operations if they had been instead deployed for them. These eight groups contained four aircraft carriers, including one of the RN’s prized (and much requested) fleet carriers, the Ark Royal, a British Battlecruiser, HMS Renown, two French Battleships, Dunkerque and Strasbourg, along with twelve more cruisers – all in addition to those that served under the command of Commodore Henry Harwood in Force G.
The task of tracking down a surface raider might seem impossible pre-satellite reconnaissance and radar but it becomes educated guess work. As the problem for any raider is that every time it does its job and takes out an enemy ship, it gives another marker to the enemy to help them locate it – the more it takes, the bigger its impact, but just as importantly the more the enemy knows. Furthermore a surface raider must do its best to avoid contact with enemy heavy units, as any damage it takes will be difficult to impossible to repair. Know all this is what lead to the Harwood ‘Gamble’ of concentrating on the River plate – made to seem more audacious in the movie, in reality was still brave, but a product of good training and thinking, rather than illogical inspiration. HMS Exeter was of course not alone within Harwood’s force, she was combined with HMS Achilles and HMS Ajax. Both Leander class light cruisers, each fitted with eight 6in guns in four twin mounts, four QF 4in guns in single mounts, twelve 0.5in Vickers machine guns and eight 21in torpedoes in two quadruple mounts; displacing 9,740t fully loaded, with a top speed of 32.5kts and a range of 5,730nmi at 13kts. At speed therefore the RN’s cruisers could outpace the Graf Spee, but it was in cruising range, range of armament, and armour that it had the advantage. The Battle started for HMS Exeter first, she was sent to investigate the smoke seen at 06:14hrs on the 13th of December 1939 and it was she who received first fire at 06:18 – Harwood’s tactic worked though, as only one of Graf Spee’s turrets concentrated on her, the other fired at Ajax. Within five minutes all the British ships were returning fire, whilst manoeuvring according to the plan laid out by Harwood in his signal. In fact from that point on, Harwood trusted his officers, Captain Perry in Achilles (who manoeuvred his ship to clear her line of fire, whilst still remaining close and conforming with the movements of the flag, Ajax) and Captain Bell in Exeter trusted to be his own division, acting independently but still in concert. It was most likely owing this speed of action, that it was some minutes before Graf Spee decided to concentrate fire on Exeter. 16. Captain F.S. Bell, Royal Navy then decided to fight his ship from the After Conning position, but owing to communications be destroyer it was some time before the ship could be brought under the control of the position, and then it could only be done by means of a chain of messengers to pass order to the After Steering position. Meanwhile “Exeter” had swung to starboard, and was closing her “A” arcs, but she was brought back to port by an order from the Torpedo Office, Lieutenant Commander C.J. Smith, Royal Navy who succeeded in getting word through to the Lower Conning position. Two more 11-inch hits were received in the fore part of the ship during this phase. 17. “Ajax” and “Achilles” were in Concentration firing and seemed to be making good shooting. They were closing the range rapidly and gaining bearing on the enemy. At 11:05, I received a signal from “Exeter” who reported that all her turrets were out of action and that she was flooded forward up to No.14 bulkhead but could still do 18 knots. I ordered her to proceed to the Falkland Islands at whatever speed was possible without straining her bulkheads. She later reported that one gun of “Y” turret could be fired in local control. The River Plate is interesting battle, because not only did it show both theories of British commerce protection cruiser construction correct (an 8in cruiser was useful for the job, but numbers provided by 6in cruisers decided it by dividing fire and proved fairly capable themselves), the use of a ‘destroyer’ style operational manoeuvre meant that in the face of what on paper was a superior opponent the British never lost the momentum. That these tactics were helped by Langsdorff’s decision to handle Graf Spee in an aggressive manner, is to one side. Langsdorff was caught in a position, where he could not concentrate his, on paper, superior firepower. The enemy was too numerous, too aggressive and perhaps most problematic, too fluid in their movements, he could and did damage them, but he was also damaged himself and he was found. On this occasion Exeter emerged the victor, in 1942, in the Battles of the Java Sea, the Japanese would turn this scenario around on Exeter. As well-known as the Battle of the River plate is, Java Sea, like much of the British pacific war is forgotten – even Andrew Boyd’s work, The Royal Navy in Eastern Waters; Lynchpin of Victory makes no mention of it in its 540+ pages. This could be for many reason, it was an Allied action involving Dutch, American and Australian ships, as well as British. It was under the command of the Dutch Rear Admiral Karel Doorman. It was a small force he commanded though, just two heavy cruisers, including Exeter, three light cruisers and nine destroyers – many of WWI vintage and with limited to no air support available. Small it may have been, but it was given a grand title – American-British-Dutch-Australian Command (ABDACOM) Strike Force. The first battle on the 27th of February 1942, was a long running affair, basically a convoy surface engagement, with the ABDACOM Strike Force trying to reach the convoy and the Japanese beating them off. The allies had been weakened early, as Exeter was critically damaged by an 8in shell hitter her boiler room; at a stroke taking away half the forces 8in guns, but most importantly the only allied ship with gunnery radar. 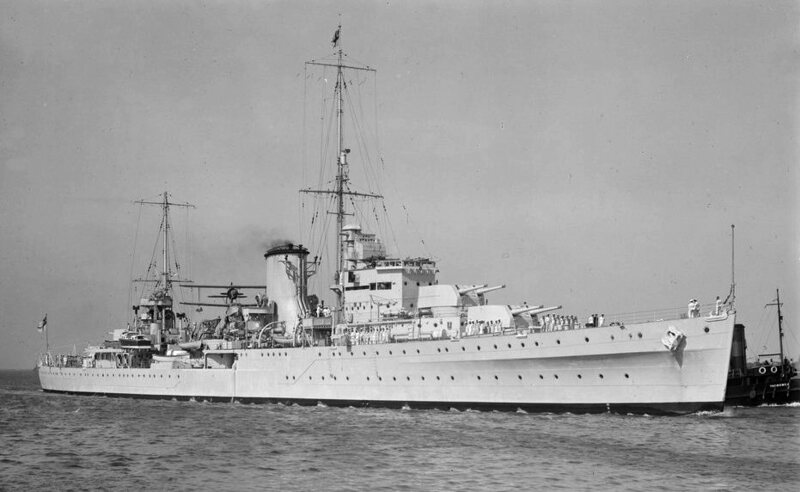 It was a reprieve for her to withdraw, as that night at 23:00hrs during the final rounds of the first battle, Doorman’s own flagship the De Ruyter and the other Dutch light cruiser, the Java, were sunk by torpedo salvo – leaving only HMAS Perth (a modified Leander class vessel) and the American heavy cruiser, USS Houston (which had started the battle with only two out of three turrets working, reducing it from a nine to a six gun salvo) to follow Doorman’s last orders and retire. All this was done and more, to buy the troops ashore on Java a short period of respite. Having withdrawn to Surabaya, Exeter affected repairs as best and as quickly as she could. That is why, veritably limping at 23knots, escorted by the destroyers HMS Encounter and USS Pope, she headed for the Sunda Strait, hoping to make it to Ceylon and repair. Unfortunately it wasn’t to be, they would end up meeting a force comprised of four heavy cruisers and five destroyers. They first spotted them coming from the west, at which point Exeter and her escorts turned away to try and avoid as they were in no shape to fight. Then more ships were sighted coming from another direction, then more from another, as the hours of the day went on the enemy ship numbers grew. Until at 10:20hrs the enemy came within range. Despite the destroyers laying on smoke and Exeter returning fire as best she could, she received another hit to her boiler, reducing her speed further and finally she was hit by two torpedoes starboard side, fired by the destroyer Ianzuma, sinking at 11:40hrs. As with the Graf Spee, once found she had nowhere to run, damaged already and without the ability to resist to her fullest she still put up a hard fight. Exeter and her crew tried to buy time for the destroyer to escape and for a short while USS Pope did manage it. It was always going to be a short term thing though. It is though, a testimony to her crew that she achieved as much as she could; the forces in the Far East had been designed as a deterrent, but unfortunately there was enough available to give that deterrent enough potential to deter once war began… as the Japanese new the main fleet, which deterrent rested upon, was very much occupied elsewhere. Exeter was not even part of the deterrent, she’d only deployed after war began; she had arrived in the east on the 13th of January 1942. Along with other ships, she was as much as could be spared, but she was also too little to stabilise or defend – they were sent to buy time. That they did, at the Battles of the Java Sea and others they bought time, time for defences to be prepared, for more ships to be ordered, for plans and allied structures to be put together that would lay the foundation for eventual victory. This would make an ok end for this ‘short’, but for Exeter, though perhaps it is better to look to the words of one who commanded her https://www.youtube.com/watch?v=QD9xt9HOAWY, for the final say. Konstam, A., 2013. The Battle of North Cape; the death ride of the Scharnhorst, 1943. Barnsley: Pen & Sword Maritime. Moretz, J., 2014. The Royal Navy and the Capital Ship in the Interwar Period. Abingdon: Routledge. Neilson, K. & Kennedy, G. eds., 2009. Far Flung Lines; Studies in Imperial Defence in the Honour of Donald Mackenzie Schurman. Abingdon: Routledge. Speller, I., ed., 2013. The Royal Navy and Maritime Power in the Twentieth Century. Abingdon: Routledge. Stille, M., 2005. Imperial Japanese Navy Aircraft Carriers 1921-45. Oxford: Osprey Publishing. Stille, M., 2014. US Heavy Cruisers, 1941-45 Pre-War Classes. Oxford: Osprey Publishing Ltd.
Stille, M., 2014. US Heavy Cruisers, 1943-75; Wartime and Post-War Classes. Oxford: Osprey Publishing Ltd.
Sumida, J. T., 2001. British Naval Procurement 1919-39. In: P. P. O’Brien, ed. Technology and Naval Combat in the Twentieth Century and Beyond. London: Frank Cass Publishers, pp. 128-47. Till, G., ed., 2006. The Development of British Naval Thinking. Abingdon: Routledge. Whitley, M. J., 1996. 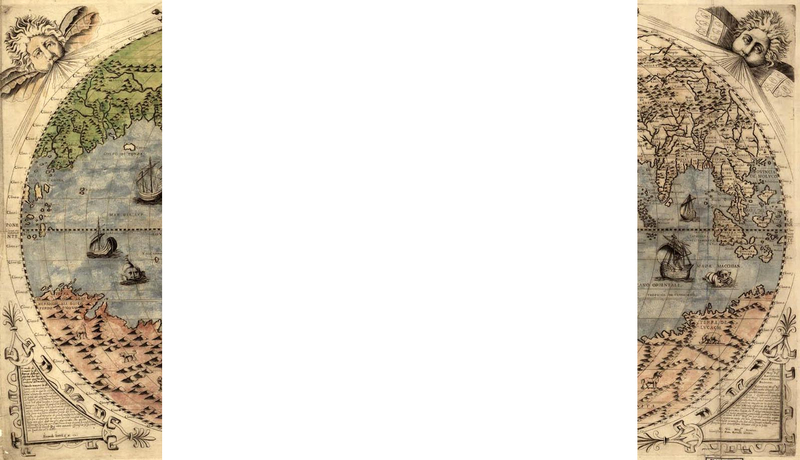 Cruisers of World War Two; An International Encyclopaedia. London: Arms and Armour Press. Wooldridge, E. T. ed., 1993. Carrier Warfare in the Pacific; an oral history collection. Washington: Smithsonian Institute. Wright, M., 2016. British and Commonwealth Warship Camouflage of WWII, Volume 3: Cruisers, Minelayers and Armed Merchant Cruisers. Barnsley: Seaforth. TNA – ADM 1/27412, 1935. New Cruiser Design, Replacement and Armament. London: United Kingdom National Archives (Kew). TNA – ADM 1/8570/287, 1919. British Imperial Naval Bases in the Pacific. General Policy. London: National Archives. TNA – ADM 1/9355, 1933. Cruiser Design: Requesting views of Commanders-in-Chief, Home and Mediterranean Fleets. London: United Kingdom National Archives (Kew). TNA – ADM 1/9427, 1937. Cruiser Policy – Response to Mr Churchill. London: United Kingdom National Archives (Kew). TNA – ADM 116/3872, 1933-38. Fleet Exercises: China Station 1933, Mediterranean Fleet 1935 & 1937, Submarine Exercises 1933-36, Home Fleet Exercise 1937 & 1938. London: United Kingdom National Archives (Kew). TNA – ADM 116/3873, 1937-39. Combined Fleet Exercises. London: United Kingdom National Archives (Kew). TNA – ADM 116/4109, 1940. Battle of the River Plate: reports from Admiral Commanding and from HM Ships Ajax, Achilles and Exeter.. London: United Kingdom National Archives (Kew). TNA – ADM 116/4320, 1941. Battle of the River Plate: British views on German pocket battleship Admiral Graf Spee in Montevideo harbour; visits to South America by HMS Ajax and HMS Achilles. London: United Kingdom National Archives (Kew). TNA – ADM 116/4470, 1940. Battle of the River Plate: messages and Foreign Office telegrams. London: United Kingdom National Archives (Kew). TNA – ADM 186/145, 1929. Exercises & Operations 1929 (C.B. 1769/29). London: United Kingdom National Archives (Kew). TNA – ADM 186/158, 1937. Exercises and Operations. Vols I and II. London: United Kingdom National Archives (Kew). TNA – ADM 186/72, 1925. Battle Instructions. London: United Kingdom National Archives (Kew). TNA – ADM 203/90, 1929. Strategical Exercise MZ – Atlantic and Mediterranean Fleets 1929. London: United Kingdom National Archives (Kew). TNA – ADM 223/714, 1959. Translation of the 1949 Russian Book “Some Results of the Cruiser Operations of the German Fleet” by L. M. Eremeev – translated and distributed by RN Intelligence. London: United Kingdom National Archives (Kew). Speaking to some of the men who were on her when she went down I challenge her being sunk by torpedo. Running low on fuel and main armament expended the CO gave the order “abandon ship, sink the ship”. He wanted her scuttled so her new radar did not fall into enemy hands. All hands abandoned ship in the prescribed admiralty fashion, when the last men came on deck they were greeted by rows of boots and shoes neatly lined up. One veteran scoffed and said “I kept mine on”. He greatly benefited from this later. Most were picked up by Japanese destroyers and ended up in prison camps. The majority in Macassa (HMS EXETER post BoRP we’re in the Macassa veterans association) others were sent to work in the Japanese home islands. A number witnessed the bomb going off at Nagasaki. 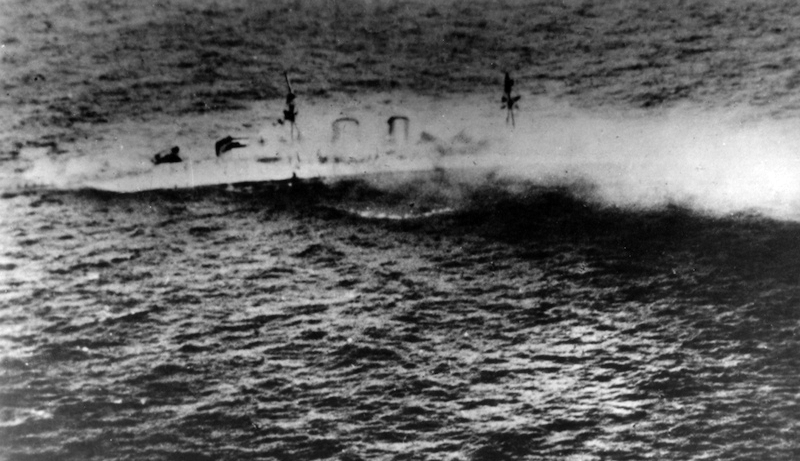 I’ve heard similar to, but the official reason given is torpedoing so that’s what I put… after all she was hit by two, which caused the damage that led to her capsizing, ect – so the RN have logged it as torpedoing and on balance a RN Captain, especially Oliver Gordon, would have been unlikely to have ordered ‘abandon ship’ because they were out of main armament, because they were trying to withdraw anyway. Saying that, Exeter had been hit in a boiler room for the second time (first being at the first battle of Java Sea); so whilst not out of fuel she was out of power. Probably why the torpedos managed to hit her, considering the accuracy the Japanese had experienced so far in the battles of the Java Sea. So frankly it could also be enemy main battery that could be said to have caused her sinking. But no she kept fighting till she couldn’t, so it’s the torpedoes we give the credit to. The crew did have a very hard war after this and some were as you say witnesses to Nagasaki. Alex, have you read Captain Gordon’s book? I haven’t read it in about 15 yrs but does he state what his actions were? I don’t remember. I served on the last HMS EXETER and was the BoRP veterans and Macassa veterans liaison officer. My comments came from their discussion of the end. Hi Paul, yes but only in a library a while back (so I’m going off notes) – I’ve got my own copy on order to help with another project and maybe to revisit this piece… my main impressions come from the national archives admiralty write up of what happened though, which are pretty good. I also had a look at some some Japanese sources and the write up of the wreck discovery, so I’m fairly happy with the timeline that she had stopped in water, due to boiler damage and whilst Captain Gordon’s intentions may have been to abandon ship & use charges (because as you say there was important stuff aboard) if necessary, the Japanese did their bit to make it unnecessary http://www.combinedfleet.com/inazum_t.htm and it all took place in less than 20 minutes, which if the time for things to happen is factored, is not a lot of time at all. My feeling though from the reading I have done, is that if he’d had time to do anything Captain Gordon would have tried to fix his ship and keep going as he’d done at the firs battle of Java Sea. I’m reckoning Exeter is going to make a comeback with the Type 26 Class, probably not first three, but it’ll be in there.